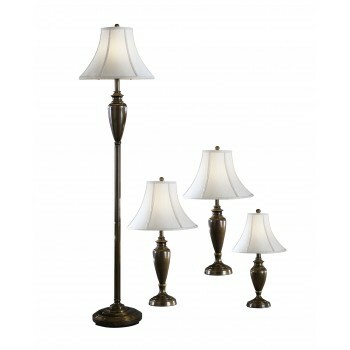 Lamp Group Includes 1 Accent Lamp, 2 Table Lamps and 1 Floor Lamp. Antique Brass Finished Metal. Softback Bell Shade. Table and Floor Lamps have 3-Way Switch. Type A Bulb - 150 Watts Max or 25 Watts Max CFL. Accent Lamp has On/Off Switch. Type A Bulb - 60 Watts Max or 13 Watts Max CFL.